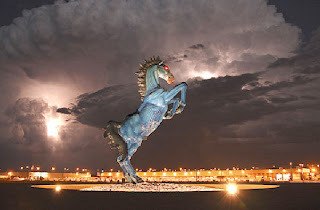 An article on a recent front page of the WSJ described a city's angst over a controversial Mustang sculpture by artist Luis Jimenez. Here's how the paper describes it, "The mustang rears on splayed hind legs-his nostrils flaring, his eyes glowing red, his taut body a slick, sweaty sheen of blue. 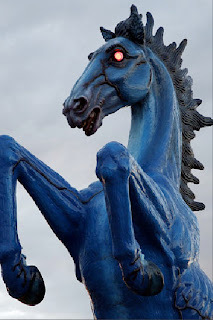 Anatomically correct - eye poppingly so- the 32-toot-tall sculpture makes quite a statement..."
The article, "A Horse of a Different Color Divides Denver" goes on to describe how Jimenez's sculpture at the gateway to Denver International Airport has the town in an uproar. It's been called "mean," "terrifying," "a demon horse" and a local developer launched a campaign to remove it. But when I read this piece, I realized immediately it was a horse of a different color. Not too long ago we created a series of artist portraits for the Smithsonian American Art Museum. One of those featured Luis Jiminez. A gentle, soft spoken man, he was proud of his Hispanic heritage and had a great love of horses and the expressive moment. His work adorns the entrance to the Museum and is featured in public places across America. I was sure his flair for dramatic expression drove his creative impulse to create what he probably saw as a proud and heroic creature and an embodiment of the adventurous Western Spirit. Unfortunately the artist passed away last year. But his widow was quoted later in the article: "You look at the piece and you know it was built with love." She said that the stallion's neon red eyes are an homage to the artist's father who ran a neon sign studio in Texas. The keenly articulated stallion's body is a symbol of freedom, strength and the American West. And it makes her think of his beloved horse "Blackjack" that hung around just outside his studio. Which brings me to think about how differently people can perceive the same thing. Of course, that's why art exists, to make us think, feel and experience in new ways. But it also is a lesson in how we interpret and find meaning. And how easy it is to get lost within our own assumptions and ways of seeing without testing them in the outside world. And we encounter this often in our work as we try to translate our client's needs into a visual language to effectively communicate their vision. And help them move from their organizational world view to reach and impact a wider audience. And with almost everything ending up on the internet, it's even more essential that we all get it right. So the meaning and intent will be clear. And the message will be heard.